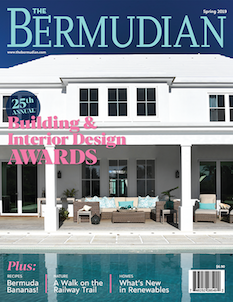 When assigned the job of compiling an informative article on Bermuda inns the task seemed simple enough. Then I was told to make a tour from one end of the island to the other, to visit each one and to glean oddments of material from the various innkeepers and bartenders. That daunted me; I protested weakly that such a job was for a chap of sterner fiber than I, and that I was not one of those rare and estimable fellows who can behave with iron self-control when faced with a colorful phalanx of bottle and glittering glasses. I feared and with good reason, that my pilgrimage might easily degenerate in a regular “pub crawl,” and that I would be undone by the spirits of the inns rather than imbued with their spirit, which is what the editor wanted in the article. Still, the prospect was rather alluring, especially when I was offered a two-day holiday from the office in which to visit the places listed. Now that it is all over, I am swamped with reproaches, my own and my editor’s, for I was unfit for duty after the two days, and after a thirty-six hour hangover, my recollections of what I learned are nebulous, and wouldn’t enlighten a cow. Clearest of all are the odors of beer and rum which seem to hang about me like a miasma. I started out in Sandy’s Parish and worked eastward by easy roads and pleasant stages. There was a the Loyalty Inn, one of the oldest in the colony, a charming place with white gables, and situated in one of the fairest spots in the West End, beside the blue stretches of Mangrove Bay. I got there a few minutes before ten a.m. and cooled my heels waiting for the place to open, dangling my legs over an old wharf and watching a heavily laden black sloop lazily making its way to Watford Bridge. The shutters of the loyalty Inn were thrown back and I rose, bracing my resistance and registering moral resolution. Yet I caught myself involuntarily licking my lips. I climbed the wooden steps to the latticed porch and marched into the taproom. In a surprised tone the bartender greeted me. Perhaps is was my own unaccountable sense of guilt, but mixed with his surprise at so early a patron I thought I detected a supercilious reproof. Hastily I explained my missions, and then we chatted undisturbed for half an hour or more. I’m certain he told me lots of interesting things about the Loyalty, but they’ve slipped my mind. Still I suppose he’ll tell them to anybody if they’re interested. In the cool tray-ceilinged room the beams were joined with ship’s joints, giving the place that salty flavor that characterizes most of Bermuda’s old buildings. The bartender, son of one of the old Somerset pilots, said the place was well over two centuries old. I asked him what was the most popular drink sold there. Black rum, of “Nelson’s Blood” he told me, and I felt obliged to sample some. Not until I got out of the blazing sunlight again did I feel it kick, and then I decided to treat black rum warily for the rest of my journey. Frith’s Bar, also on Mangrove Bay, is a new place, very well appointed and genteel enough to entertain a lady there. The next leg was about three miles, and demanded the climbing of two terrific hills. But in spite of being dusty and hot and dry, I enjoyed cycling along the white road beside that exquisite beauty spot, Ely’s Harbour, with its group of tiny white-beached islands that form a natural protection to the long reach of water. The White Hill Tavern is just beyond Somerset bridge, and it boasts a Palm Gardens. Also it claims to be the site of the oldest Masonic Lodge in the Western Hemisphere and it probably contains parts of the original building. I went in through a Dutch door into the barroom and ordered a beer. It was ice-cold and delicious after that frightful climb up Scour Hill. There was a billiard table in the barroom; an ante-room containing rough benches and deal tables was sacred to the villagers who gather there of an evening to play euchre. The little set-in windows are barred with cedar slats and look out upon the inn courtyard. The inn overlooks a rural cricket field, and possesses a pavilion outside from which one might watch a game in progress without interrupting the more serious business of dealing fairly with a summer thirst. There was a match on then and remembering I had two days at my disposal I ordered a rum punch and watched for an hour. The game was slow, as it should be in that tranquil spot, and I found it soothing and appropriate to my relaxed mood. Regretfully I mounted my wheel and struck off along the North Shore Road in quest of the Waterlot Inn. I passed Black’s Bay with its two derelict hulks lying half-submerged by the shore and facing the cedar-studded hills of Southampton. Wrecked ships always have a romantic air about them; nothing suggest so eloquently the realities of life and death, it seems to me. These spoke to me of futility and I felt depressed as I left them behind and finally came upon the Waterlot, nestling by the bay almost in the shadow of Gibb’s Hill Lighthouse. Nothing could have been more bracing than Miss Claudia Darrell’s robust “Good Morning. Come right in and make yourself comfortable.” She made me discard my damp jacket and led me to the bar, one of the most cheering in the Islands. Once it was the main storeroom for the cargoes discharged from the ships that used to play in considerable numbers in and out of Southampton Bay. The old building was constructed by Miss Darrell’s ancestors more than three hundred years ago and remains except for detail unchanged. When commerce deserted Port Royal, what was the big storeroom became a stable. Waterlot is celebrated for its superb lobster luncheons. Even the big hotels are likely to suggest lunch at the Waterlot Inn to their guests as a delight no to be missed by any visitor to Bermuda. At least as interesting and entertaining as the inn itself is the hostess who is what is generally called a “character.” Her family is one of the oldest in the Colony. She is sociable, chatty, and blessed with a vigorous and gusty humor. I spent a thoroughly pleasurable hour with her, and warmed spiritually and physically by her hospitality, went on a long Middle Road. I think I passed one or two other establishments where one might take refreshment but these I sternly neglected, for I had decided to make the next leg a non-stop run to Hamilton. I went straight to the New Windsor Palm Gardens; I was hungry from the long ride and so much talking, I suppose and the New Windsor can cope with a voracious appetite better than most places. That business was pretty good was indicated by Benny Peniston’s bland smile of welcome. I found a vacant table and beckoned to Fox, who sometimes waits and sometimes spins the dreams; the New Windsor without its turtle, Sloe Gin, and Fox, the headwaiter, wouldn’t be the same place. Somebody I knew stood me to a Martini. I was a bit dubious about mixing it with the rum I had consumed that morning, but it tasted fine. Funny thing about rum, anything seems to blend gracefully with it once its down. I had a turtle steak after a bowl of turtle soup, and the edge of my hunger was gone; so was my desire to move. Even my conscience had left me, and although the day was but half over I succumbed to an overpowering urge to sleep. That evening I felt sorry about it; sorry about everything; sorry for the editor, but most sorry for myself. I had a sudden surge of compassion for all mankind that must work to live, and didn’t recover until strolling along the Pitt’s Bay Road, I found myself faced with that delightful new restaurant, Capri Steps. I sat on the verandah overlooking Great Sound, and the sun setting cast a rich crimson glow on the smooth waters. There were more small parties of people about, and conversation was animated and gay. The place has a touch of the Riviera about it independent of it name. It is admirably located, charmingly arranged, and well-run. Before retiring for the night the notion of contrasts suggested that I drop in at the Green Shutters in Burnaby Street, where, standing at the long bar, I listened to sailors yarning about faraway ports and to an occasional bit of seditious oratory by some well-oiled citizen of Hamilton. Next morning I breakfasted ay the Quarry, a hostelry housed in precisely what its name implies. The place supplied stone for the building of the American house during the last century. For a long time after, the disused quarry was a playground for children, and then a few years ago a bar was built into it. The room is cool and dimly lighted, and the walls remain untrimmed like the walls of any other quarry in Bermuda. It is an agreeable spot to lunch or just loaf and drink the excellent Tom Collins they serve there. On my wheel again, I passed through the city and along the Marsh Folly Road to the North Shore, and made my first stop at Flatts, where stands the very aptly-named Halfway-House. Mr. Young, who would be an asset to the Ritz barroom, welcomed me cheerily, and gave me one of his Red Devil Swizzles. He couldn’t have selected a better name. The Frascati Hotel is close by, but I didn’t propose to add hotels to my itinerary. 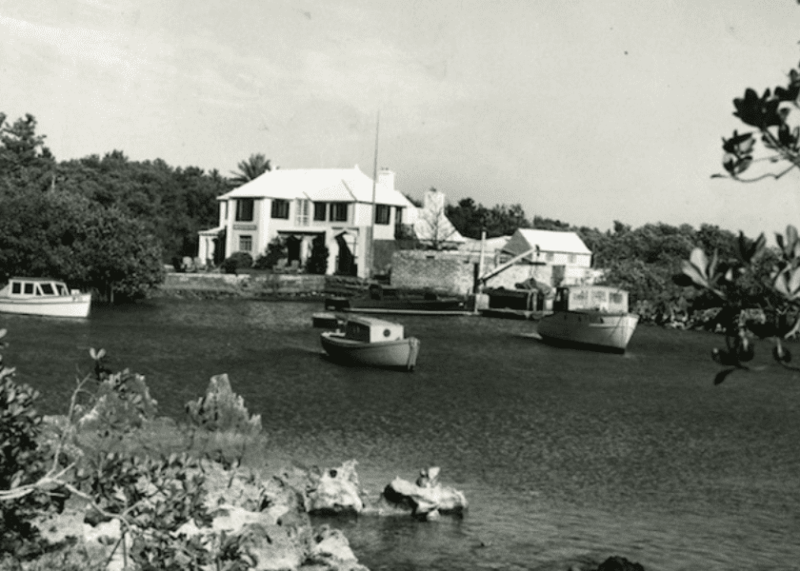 I went on around that beautiful stretch of roadway that runs beside Harrington Sound; I was headed for Walsingham, better know today as Tom Moore’s Tavern, a mecca for thousands of visitors to Bermuda. There you can pick out the lobster you’d like for lunch while it’s still in the pool, and watch it caught. Moore wrote most of his Bermuda poems amid the lovely surroundings of Walsingham. 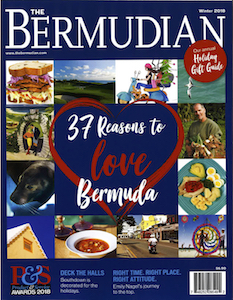 There too the Bermuda Yacht Club was formed when some thirty gentlemen of Bermuda met beneath Moore’s Calabash Tree in November, 1844, and resolved to establish the club. In the following year Royal consent was given to the club to style itself the Royal Bermuda Yacht Club. The house itself has been written about so many time in this magazine as well as other publications that I decided to confine my attention to its refreshments. Of course, there is a Tom Moore’s cocktail, and excellent it is too. I should have like to stay longer under the roof which is redolent of more gracious days and leisurely living. I passed through the “Jungle” and on to the Swizzle Inn, which was reminiscent of an old Devonshire tavern with its deal of tables and dim lights. Bill, who presides there, gave a drink which he called “Nouramahal,” named for Mr. Vincent Astor’s yacht for some reason or other. He showed me two of his treasures, one a letter from Vincent Astor himself congratulating him upon the drink, and the other a pair of walrus tusks mounted on cedar presented to him many years ago by Mark Twain, that devotee of Bermuda. Over the Causeway I wandered unsteadily, bound for the Old Town. There I had a quick one at the Royal Arms, and registered no impressions of the place at all, and another one at the Ordinance Arms. These two are near the docks of St. George’s and are very old. 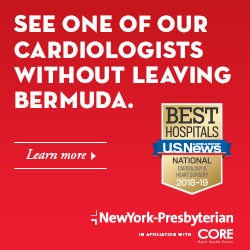 The there was the White Horse Tavern, and finally the Somers Inn, where I sank exhausted onto a lounge in the pirate Bar, a cool spacious room whose walls are covered with murals depicting buccaneers and their exploits. I was reaching the end of my tour and the end of my tether also; I had one more place to visit to complete the round, and I had saved sufficient stamina and capacity to get me over to the Black Horse in St. David’s Island. “War Baby” Fox greeted me at the Black Horse and introduced me to his Uncle George, who told me a story, now vague in my memory. It was something about a bit of cedar he had retrieved from Bermuda’s three hundred and sixty-fifth island before the island was destroyed during the dredging of a channel. The wood had come up in one of the dredger buckets, and with it Uncle George had made a model of a pilot gig. There was something else that made the story amusing, but I’ve forgotten it. While listening to Uncle George a minstrel played a concertina in a corner of the barroom while another fellow executed some intricate choreography which I watch with glassy eyes. Sitting there in the Black Horse, my travels done with, the task of writing about them loomed insuperable. So I had another drink. I had several more before the depression of conscious failure began to leave me. And then quite suddenly it all looked easy. Brilliant phrases began to pass in sparkling cavalcade through my mind as the rum passed down my throats=. What smart narrative I would write, what superior satire I would contrive, what devilishly clever periods I would construct. Confidence surged in me like a tidal wave, and I began to think of other writers. There was Priestley’s English Journey; huh, that was picayune trash compared with what I was going to write about Bermuda taverns. The consciousness of new-found power bloomed within me, and with a flourish I paid my reckoning, drained my glass, and strode out through the inn door with such purposeful vigor that I came near to going head foremost into the harbor. The escape sobered me a bit, and doubts about my ability began to return. Alas, next morning my worst fears were realized. I remembered none of those resounding sentences, those scintillating comments I was going to bring into my article; in fact I remembered practically nothing at all about any of the places I had visited. I have never felt so low or so desperate. I felt it would be easier to build the Brooklyn Bridge single-handed than to write an article about inns. I sat in the bar of the Somers Inn, a prey to melancholy; I realized that I should be back at the office instead of being still in St. George’s after a stiff night. I would resign, I thought; resign and go off to the South Seas and be a beachcomber or something without responsibility to worry me.